Hi! I'm back after my first semester in Basel and my exams (an article about my firsts erasmus' months will be on the blog soon!). What I love the most about Camille is her way to wear mini-skirts all year. I'm a huge fan of mini-skirts too. During my online shopping, I saw a lot of cool clothes that are in sale and that go well with this french style. I'm sharing with you my selection! What can be more french that the bleu-blanc-rouge? I love wearing it as a top: sweater from Le Coq Sportif is of course a must, but the marinières are the crème de la crème too! I love this one from Esprit: the baby pink is so beautiful with the red! When you think of the french girls, you think of a silk shirt with a very nice lacy bralette underneath. You can wear a bustier like this one from The Blond Salad as a top, or wear a nice bralette with something above. The point is to have a nice dress that you can layer: with a turtleneck underneath, you can wear it on winter, or with a bug chunky knit on top. 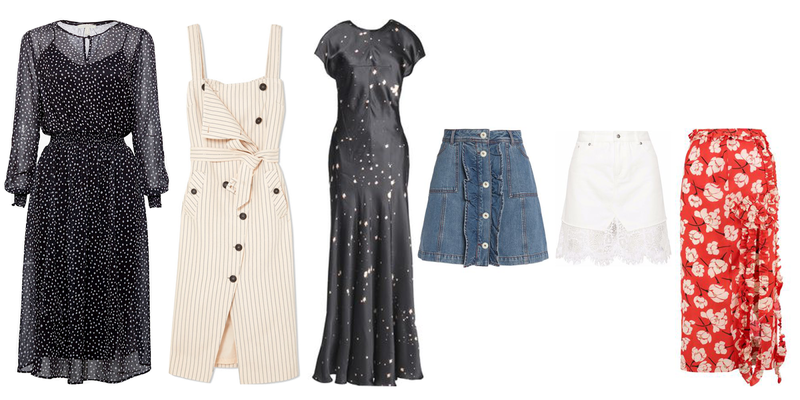 The denim mini-skirt is also a must have. This one from Ganni is cute with the nice ruffles. 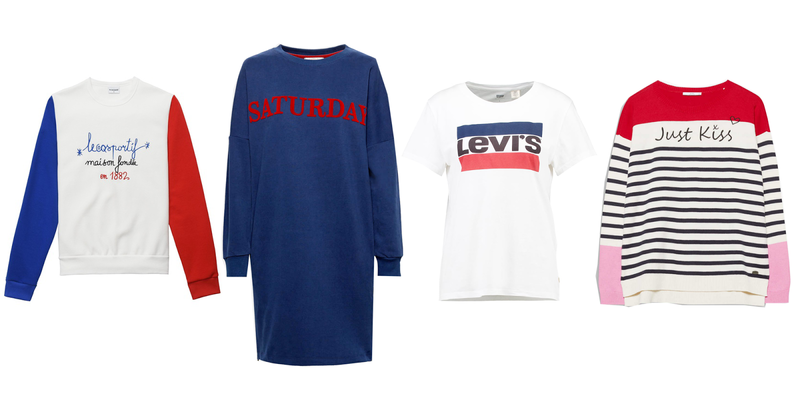 In Winter, you can wear the mini-skirt with a blazer, or a long coat, and in summer it's perfect with a t-shirt. There is 4 styles of coats for this kind of style: the blazer, the long coat, the teddy-bear coat/furry coat and the trench-coat. The dark long coat from Lacoste is a classic one: it won't ever get out of style! What is great with long coats, is that it's warm in winter, and you can also wear it at the beginning of fall with bare legs. The faux-fur bomber is also really nice with jeans and skirts! Also works well in winter and in fall. And if you want to do a safe choice: the trench-coat is the must! 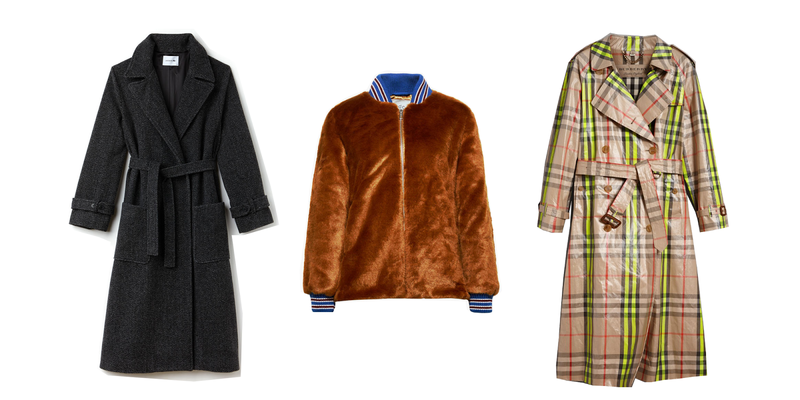 Of course the Burberry ones are the best basics but there are plenty of really nice dupes. We're almost done: we still have to deal with the shoe's problem. 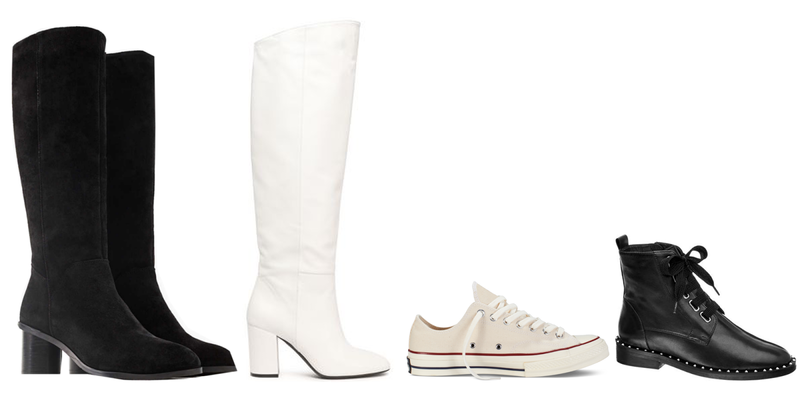 Of course, the classic white converse is la base. But for winter, boots are welcome! The over-the-knee are really trendy, but this winter, a new trend arrived: the middle heigh boot (under the knee), and a bit loose, like those ones from Esprit or the ones from Off-White. 6. Don't forget the accessories! The last step is to accessorize! 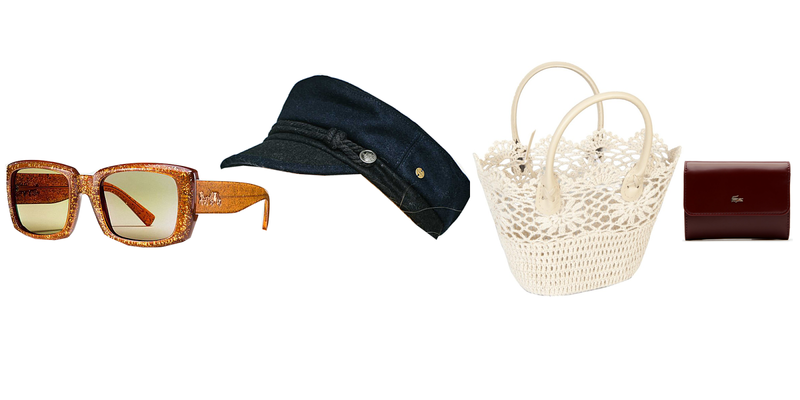 Oversized sunglasses with a vintage vibes, a hat (a béret or a cap), a basket as a bag and you're done!